It’s sweet and strongly herbal, with mint and anise (or perhaps fennel) the most pronounced flavors, along with a bit of cinnamon and a faint piney aftertaste. And of course, there’s saffron, the source of Strega’s glorious yellowness. 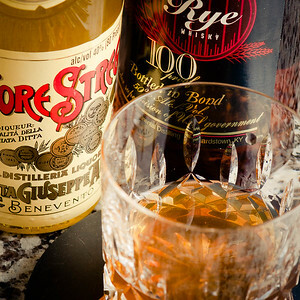 It is traditionally a digestif; I much prefer it mixed, and the Rye Witch is a fine example of its use in cocktails. Add bitters and sugar cube to a mixing glass and muddle to a paste. Add everything else, then stir with ice and strain into a chilled rocks glass. Twist an orange peel over the surface and discard. No garnish. Despite Strega’s assertive ingredients, the quarter-ounce is very subdued. 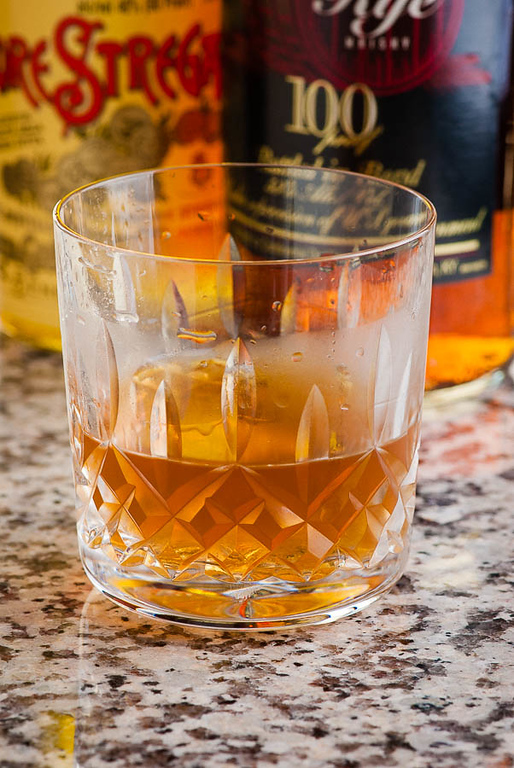 The drink’s nose is orange, from the twist, and the initial flavors are a slight sweetness, then the spicy, oaky taste of the rye whiskey. (Be sure to chill the glass before you serve the Rye Witch, else the it will warm too fast, and the sugar and orange notes will overtake everything else. In fact, the Rye Witch is not harmed at all by serving over ice, though Meehan doesn’t explicitly encourage this in PDT. ) The high-proof whiskey is pretty important here; I don’t think an 80-proof would have enough backbone for this drink. I substituted Lustau Amontillado because that’s what I had. I’m hard pressed to identify the sherry in the drink; I think it must be there to hold the other flavors together—something I’ll remember for the future. Meehan’s “house bitters,” according to PDT , are half Fees, half Regans’, but I have yet to find an orange bitters that doesn’t work well in the Rye Witch. “An evening with the Rye Witch” at cold-glass.com : All text and photos Copyright © 2012 Douglas M. Ford. All rights reserved.